A BEAUTIFUL RANCH 10 Acre Desert Retreat with endless opportunities for farming, homesteading or simply relaxing. A total of four homes are on the lot, with the main being a 2,520sqft ranch style home. The ranch house features hickory doors with matching hickory cabinets, double-pane windows, zoned heat, central air, 1,200sqft of covered patio, large open master suite with walk-through closet, quartzite floors throughout, open beamed living room, wet bar, and formal dining space. 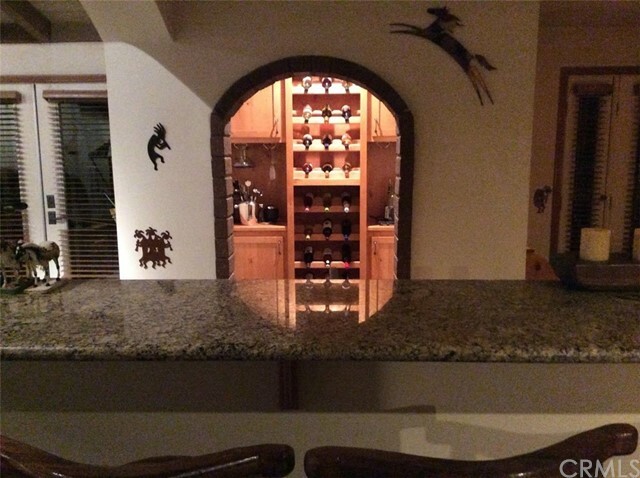 Kitchen has a large island, granite tops, commercial Viking stove, and is open to the bar, formal dining, and living room. The master suite is on the east wing of the home, while the two other bedrooms are on the west wing of the home to ensure your privacy. Many more custom features worth thousands - you must see it to believe it! Three other homes on the property - most furnished, provide the current owner temporary sources of rental income and farm-hands. One home is roughly 900sqft and was converted from the original shed that housed the tractor from years before. There is a single wide trailer that has recently undergone upgrades, and also the boulder building too. Over 300 trees, over 70 fruit bearing trees, vineyard, over 10 outbuildings, koi pond, park area, irrigation systems, two water wells, over 1250 gallons of water storage capacity, grey water system, pool, cowboy bar, gazebo, security gate, RV Access - dump & 30Amp outlet. Seeing is believing at this desert gem! Listing Provided By Rich Lee of Glorias Co.